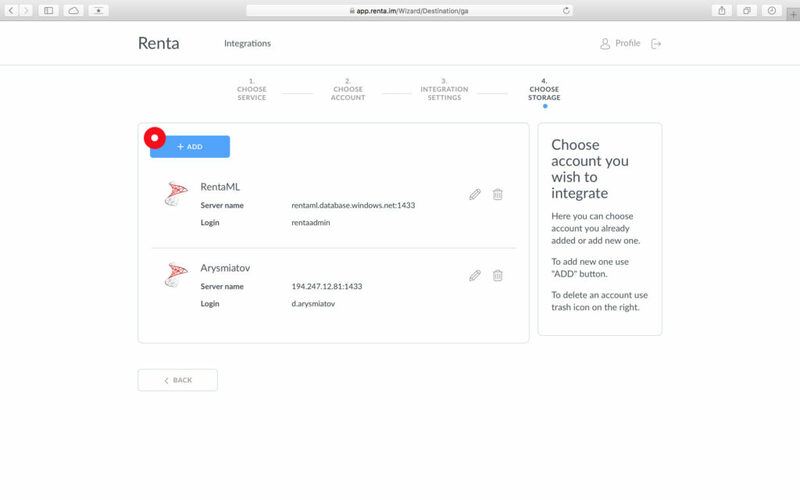 Renta automatically downloads data using Google Analytics API, and imports it into a Microsoft SQL Database. The data can then be used in different analytics systems like Power BI, Tableau, or in Excel. 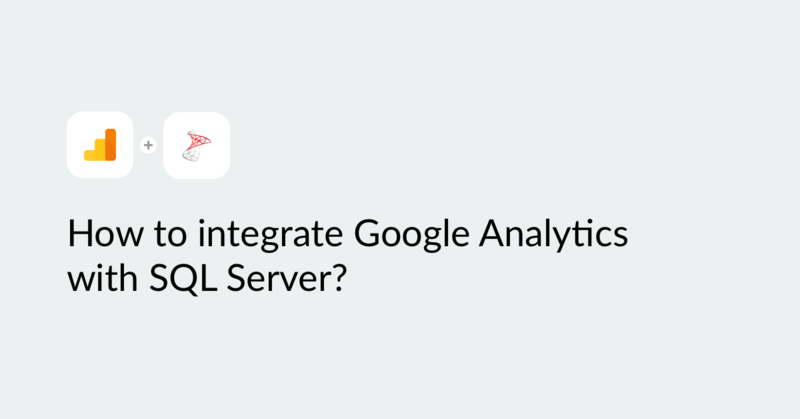 In this short video I’ll show you how to use Renta to integrate Google Analytics and an SQL server. 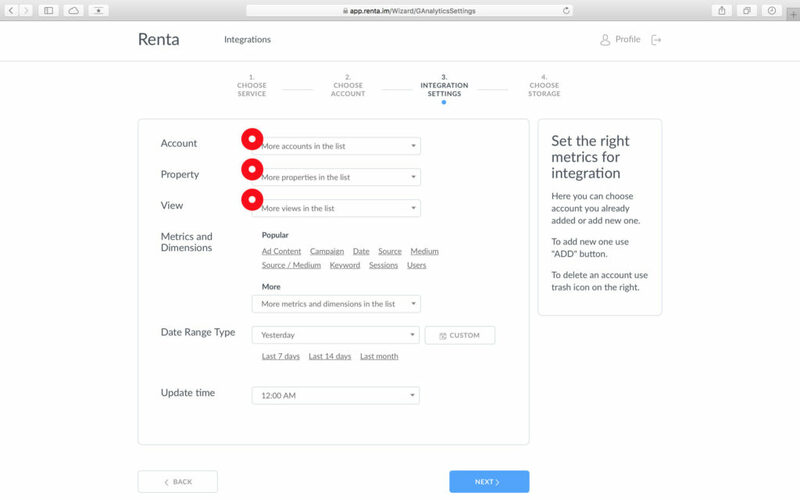 If you don’t have any integrations, you’ll see this screen instead. From here you have to choose where you want to pull data from. In our case, let’s go with Google Analytics. Click the corresponding section and you’ll be prompted to authorize. Alternatively, click Add to log in with your Google Account. Then make sure to hit Allow when Renta asks to view your Google Analytics data. When done, you’ll see your account integrated. You can have multiple accounts integrated into Renta, and choose any one of them to work with. 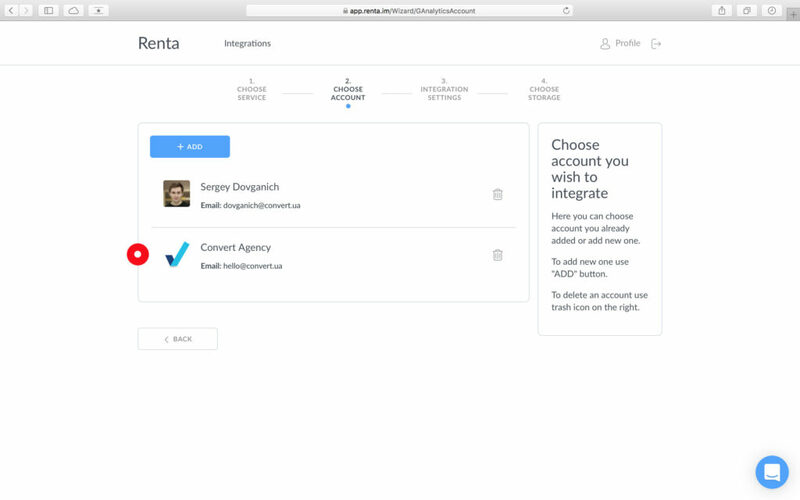 Click the account you want to work with, and you’ll be taken to the Integration Settings. Here, you can choose from the Google Analytics accounts linked to the Google account you specified earlier. Use the dropdowns to choose the Account, Property, and View you need. From the Metrics and Dimensions list, check the ones you need. You can either go with the most popular ones (offered as clickable tags), or choose others from the dropdown below. The whole interface is very similar to that of Google Analytics, so you’ll have to issues navigating it. Then let’s set the Date Range. 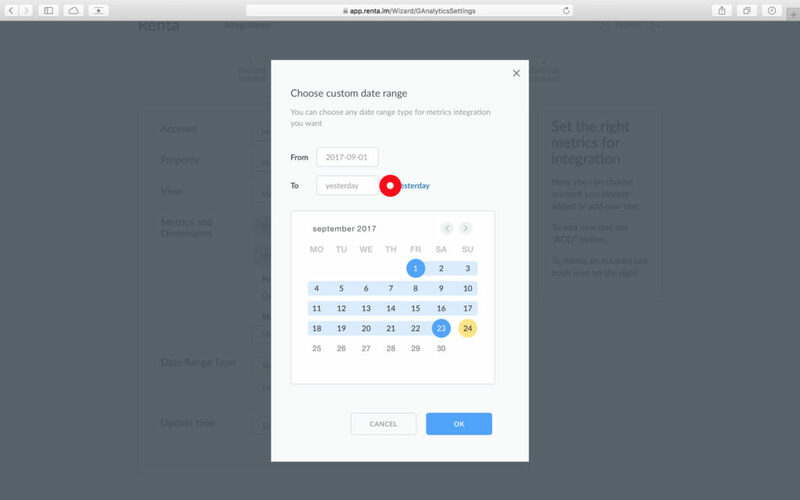 If you need the data to constantly update, click Yesterday and OK in the Custom Date Range popup. Now you’ll always have fresh data up to the previous day. Hit Next. This window can take a little while to load, and that’s perfectly normal – it occurs because the service needs to go through validation and fetch the data from Google Analytics. When that’s done, you’ll see the list of servers available. So you’ve gone through validation, obtained the data, now you need to store that somewhere. You can either choose an existing database, or create a new one with the Add button here. If you need some other port, make sure to enter that, too. Hit Ok, and the database will appear in the list. And the final step: click the database you need from the list, and you’ll see processing in progress. ‘Show More’ reveals the details like the database used, metrics, and even the amount of data processed. Now you can see that the table has been created in your database (we use Navicat to work with our databases). All the data requested is now available in the table. Now the data can be used in business intelligence tools. For example, Power BI. 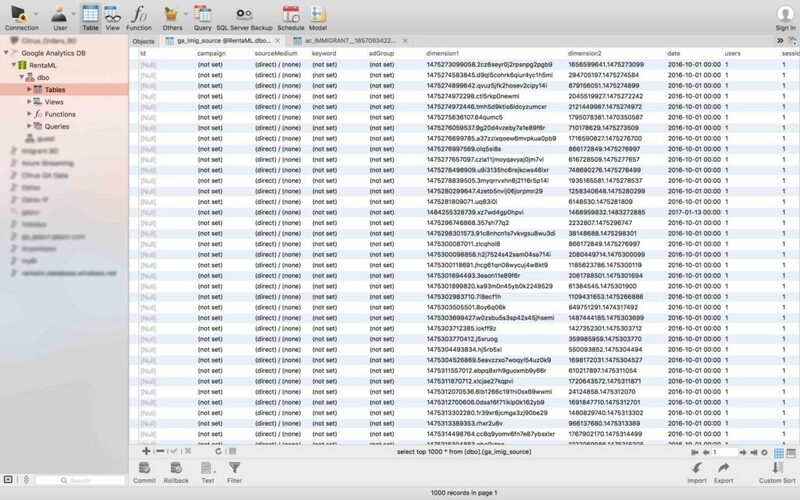 To avoid sampling, the data is downloaded day-by-day. For example, you’re downloading the data from the three-day period between September 1 and September 3. 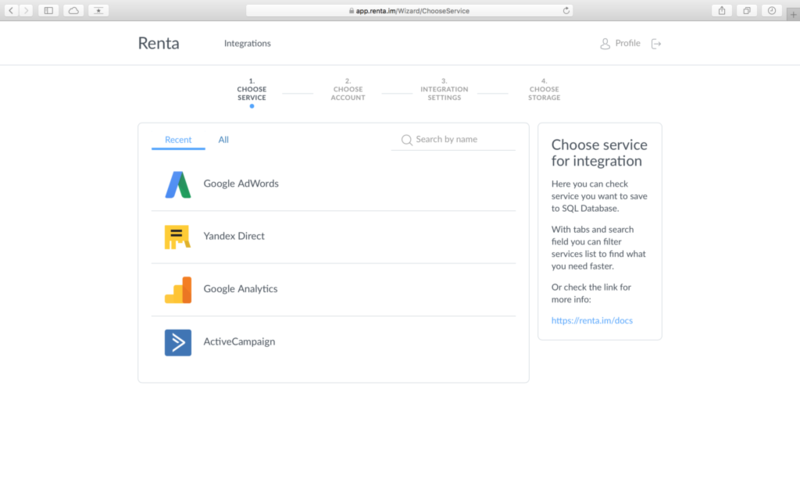 Renta sends 3 separate queries to Google Analytics API, reducing the amount of data for each query. For most projects, that allows to completely avoid sampling.